I am extremely excited for next week, as it marks the date of my first REAL product launch. 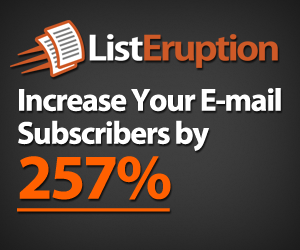 As many of you know, I have been working on a WordPress plugin called List Eruption that I anticipate will make a huge impact on the industry. This WordPress plugin has been one of the core reasons why I have been able to build thousands of highly targeted e-mail subscribers to my list! Now I am ready to release it to the public, so that everyone can take advantage of its power. However before the official launch on MAY 3rd at 10am I thought I would do a series of posts that are related to list building and WHY list building is vital to anyone’s success online. This will be a five part series leading up to the List Eruption launch date. Without very a due, let’s dive into the first essential list building tip. I’m sure you already know that by giving away something for free, in exchange for a visitors name and email address is one of the easiest ways to gain new subscribers. However there are a few tips that a lot of the experts list builders don’t talk about, that I thought I would share with you. Say you add a free whitepaper PDF to your blog that people can download by giving you their contact info. 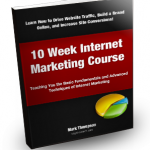 For many visitors, they may see this whitepaper as “just another whitepaper” because it’s a freebie. However if you assign a dollar value to your offer, it ups the perceived value of your offer. Even if you are giving it away for free, state that it is a “$127 Value!”. By placing a value to your piece of content, the perceived value will go up and will make the subscriber feel that they are getting an amazing deal! Since a user is going to be downloading your content on the web, there is no tangibility factor to your offer. Something that all people like is being able to touch or feel something they are going to be getting. Since we can’t do that, we need to make it feel to the user that this is something they can actually hold. The best way to do this is by using an eBook cover graphic. By creating an eBook cover for your whitepaper or PDF you make it seem more tangible and that the user will be able to hold your product. This can have a dramatic impact on your subscriber rates! I recommend using the eCoverCreator 3D software to easily create your eBook covers. Make sure you come back tomorrow for the next Mind-Blowing List Building Tip #2!